Purple Bikes is a non-profit cycling co-operative where anyone and everyone can access affordable DIY repairs, bike servicing, bicycle rentals, advice, and training. The Purple Bikes workshop operates with the principle of do-it-yourself. We provide the tools and mechanical instruction for members of the London community to repair their own bicycle. Our volunteer mechanics will advise you on how to perform your own repairs. No mechanical experience is necessary, only the willingness to get your hands dirty! But if you don’t want to we do offer bike services at reasonable fees. We also sell new and used bike parts at competitive prices. So whether you need to change a flat tire or overhaul your whole bike, the Purple Bikes Workshop is here for you! Membership allows you to use our tools, access the expertise of volunteers, attend workshops and take part in group rides for its duration. We offer a selection of road, mountain, and hybrid bikes. All rentals include a helmet, lights/reflectors, and a U-lock. 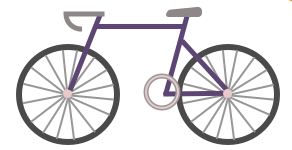 Purple Bikes will evaluate the condition of the bike and accessories and will, if necessary take from the deposit the amount required to fix or replace any damaged equipment that is returned. We are always looking for volunteers to join us. Drop by the shop during our hours and start wrenching! We encourage people eager to learn more about bikes to come in and volunteer. Helping other members with their repairs and maintaining the rental fleet are great ways to gain experience and there will always be someone knowledgeable around to offer advice and assistance. We will provide training if you have no prior experience. We aim to make bicycles more financially accessible to promote sustainable transportation in London. We will gladly accept any donations of bikes, bike parts, tools, or other cool bike related things. From Booster Juice, walk down the hallway towards Huron College/Western Road. Just before the glass doors leading outside, you will see the Purple Bikes workshop on your left. The Mustang Lounge will be on your right.